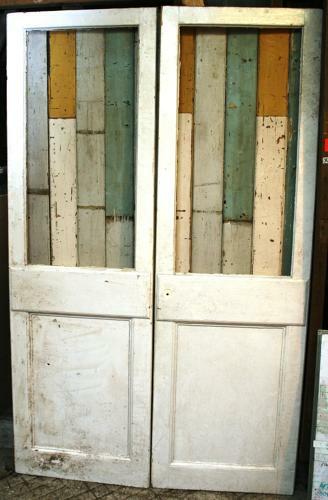 A tall pair of painted pine doors originally hung on large swing hinges to allow opening both ways. Please note there are large cutouts where the original hinges fitted. These need to be patch repired or filled. The doors have had surface mounted panels fitted to the middle rails to protect them from wear and tear. Fully morticed and tenoned and ideal for internal or external use. We can quote to glaze the upper panels if required.